Is this the fourth year Hipstamatic has done the RetroPak grab bag of film and lenses? 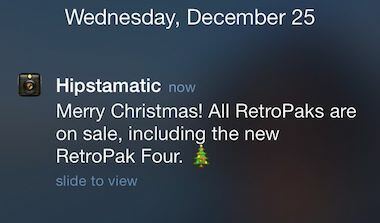 Just announced is a discounted RetroPak Four with lenses and film that are normally only available through other groupings. “Discounted” is 99 cents for the whole Pak, where normally 99 cents would get you one or two films with a single lens. Each lens and film detail can be reviewed. It is a Pak though so you get all or nothing, even if you own a few of these Hipstamatic add-ons.